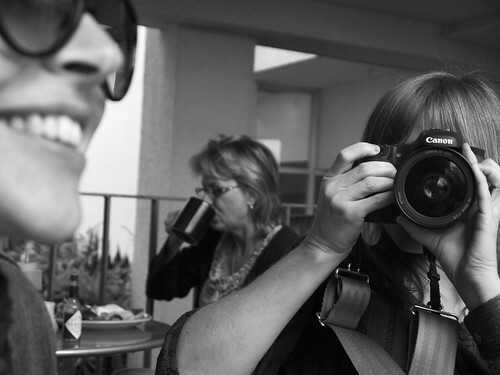 Here is a photo I took of Kate Inglis and Bon Stewart at Cafe 222 in San Diego,* on the morning after BlogHer. And here is the very photo that Kate was taking at the moment that my shutter snapped. Bon serves as our plane of refraction in this photographic regress. 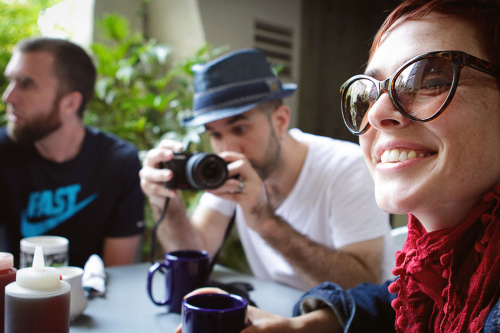 One day this kind of instant, in which two people are caught recording each other’s image, will be unremarkable. But for now let’s groove on the relative rarity. Please note that she was smart enough to focus on Bon and leave me and Jon blissfully blurry in the background. *I would post a link to Cafe 222’s website, but it’s all Flash, with autoplaying audio. I will spare you that and recommend you Google the place on your own time. Also, as you may be surmising right this very moment, Kate is the one responsible for all the cancer in the world and half of the diabetes my header image, which was taken that same morning.